We’re BACK! The CBA Ethics Committee and the Law Club once again join to present legal ethics in a fun and song-filled format! 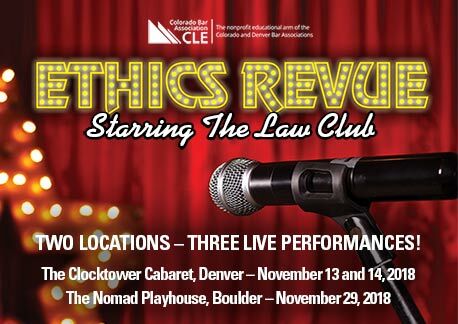 On November 13 and November 14, 2018, in Denver and on November 29, 2018 in Boulder, you can once again experience the unique humor and music of the Law Club. Plus, quick thinking commentary on a variety of ethical issues will be provided by an astute CBA Ethics Committee panel, moderated by Charles Luce, Esq., Moye White LLP, Denver. Ethics credits, musical merriment, and a cash bar–what could be better? Get your tickets now! We’re BACK! The CBA Ethics Committee and the Law Club once again join to present legal ethics in a fun and song-filled format! On November 13 and November 14, 2018, in Denver and on November 29, 2018, in Boulder, you can once again experience the unique humor and music of the Law Club. Plus, quick thinking commentary on a variety of ethical issues will be provided by an astute CBA Ethics Committee panel, moderated by Charles Luce, Esq., Moye White LLP, Denver. Ethics credits, musical merriment, and a cash bar–what could be better? Get your tickets now! Come join the Law Club as we learn about the regulatory framework underlying the push for clean cars in Colorado. The talk will be given by Sam Caravello, an associate at Kaplan Kirsch Rockwell who specializes in litigating environmental and administrative law cases, with a particular focus on cases involving the Clean Air Act. And perhaps more importantly, she is the Law Club’s Treasurer and performer in many of our past shows. You don’t want to miss this! Also, many thanks to the law firm of Moye White, who is hosting this month’s luncheon. The cost of the presentation is $15. Attendees will receive one general CLE credit.